Upbeat Piano Studio is pleased to introduce ukulele lessons to our catalogue of offerings. Lessons are available in-home in the East York, North Toronto, and North York areas, or at the Leaside Presbyterian Church. The ukulele has enjoyed a sort of renaissance in recent years, thanks in part to its inclusion in popular and neo-folk tunes. It has had a prominent role in songs by The Beatles, Elvis Presley, Jason Mraz, Adele, Vance Joy and Israel Kamakawiwo’ole. This small, four-stringed instrument is a staple of Hawaiian music and produces a bright, distinctive sound. The ukulele makes an excellent instrument for beginners, and many find it easy to learn. Due to its manageable size, it’s a great choice among stringed instruments for small children. There are four sizes, each with its own tone, ranging from the small, high-pitched soprano to the somewhat larger baritone. 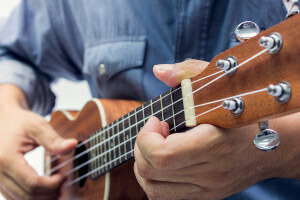 Because many musicians are able to see fast progress when learning the ukulele, it can be an excellent way to motivate students to stick with their music lessons. Music lessons of all types are of great value to people of all ages, but have particularly pronounced benefits for children. A wide array of studies have demonstrated that kids who are involved in music tend to have stronger development in verbal, social, cognitive and fine motor skills than those who don’t play music. Musical kids, in general, have longer attention spans, better fact retention and recall, greater self-discipline and a higher degree of self-control than their non-musical peers. The focus and discipline required to learn an instrument trains students for many crucial life skills, and the intrinsic reward of success is one of life’s best instructors. At Upbeat Piano Studio, we are excited to share the many wonderful benefits of music with our students. Whether you’re interested in lessons for yourself or your child, our talented, passionate instructors are ready and waiting to travel with you along your musical journey.